How To Display Image In Android Studio Using ImageView? In this Android Studio tutorial I am going to show you in step by step how to display an image on android layout. This tutorial will be very helpful for those who are beginner in android developing. It is going to be really so easy. Just follow this tutorial to know the easiest way of adding image on your android app. So how to display image on android layout in Android Studio? In android ImageView is simply a view you embed within an XML layout that is used to display an image on the screen and it is the simplest way to show a image on android app. I am going to show you the XML code for ImageView so that you will understand how it looks. The above images showing you the location of drawable directory and also the second image displaying drawable directory with some images. You have to copy and paste your image inside drawable directory. 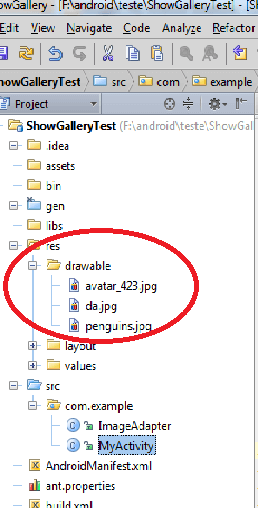 Choose the image that you want to display in your android main xml layout and paste it inside drawable directory. 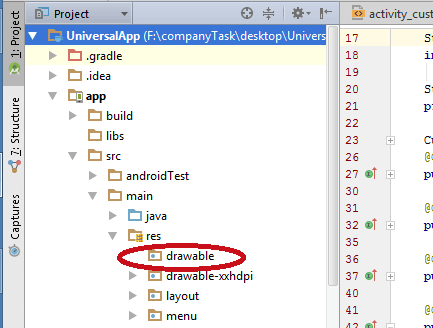 In the above code you can see android:src=“@drawable/my_image“ which indicate the image path inside drawable directory. Just change the image name as yours. And keep it in mind that it will not support JPG type image, so do it using PNG type image. That’s all you need to do to display an image on your android app. Now build the apk for android and test it with your android device or install and run it from virtual android device on your PC and you will see the image that you have added through the main xml layout file using ImageView code. Using ImageView in xaml layout file is the easiest way of displaying image on android screen. So was that easy for you? please let me know if you have understand it or not. I am always available here to help you.